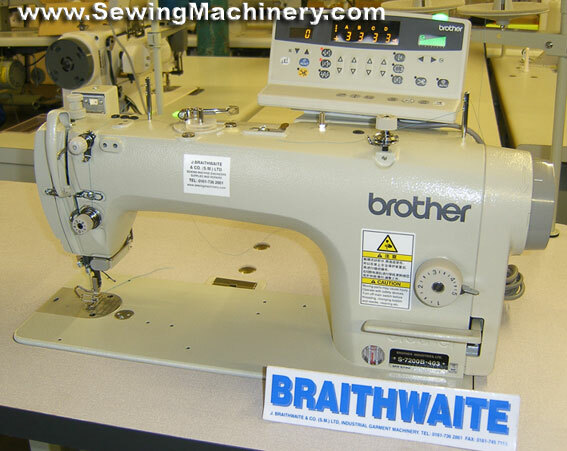 Brother was the first in the industry to release direct-drive plain lockstitch machines. 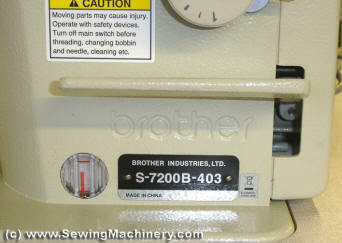 The S-7200B (replaces model S-7200A) is Brother's direct-drive lockstitch sewing machine which has been developed after many years of research and success in the market. The direct-drive system optimizes the plain lock-stitching processes that require operator control. The direct-drive mechanism provides superb levels of reliability through the use of a unique built-in direct drive motor developed by Brother. The S-7200A / S-7200B provides greater responsiveness to the operator's intentions. Minute speed adjustments can be made as required when sewing curves to make sewing even smoother. This model utilizes Brother's advanced lubrication-free technology. Sewing operations are freed from the problem of staining material. The following sub-class is the most popular version available. A sealed oil tank is used. The oil is kept clean at all times, and it is supplied at the minimum quantity required to enable high speed sewing to be carried out. The most commonly-used functions are located at the front of the L-shaped panel. A symmetrical layout has been adopted as the user interface to make the function locations easy to remember. Plus, they are grouped and colour-coded by the type of function so that you can easily find what you are looking for. A two-colour LCD panel has been adopted. The display details can be identified by colour, and easy-to-understand icons are also used. The sewing speed can be changed easily at the control display, which allows the operator to check the sewing speed visually. Settings relating to sewing machine operation can be carried out at a touch using the function keys on the operation panel. The number of stitches you have sewn is counted and a graphic display lights and buzzer sounds when a pre-set number is reached. The stitch counter lets you know how much lower thread you have used and gives you an indication of sewing length. It can be used as a production counter as well. 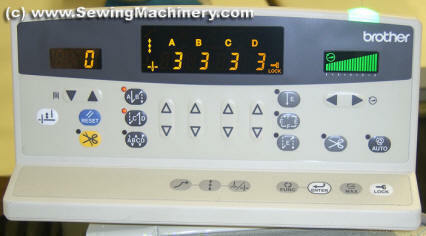 Because the panel uses a backlit LCD, the displays are easy to see. The glare from the operation panel surface has been eliminated, so that it is much less reflective and does not cause eye fatigue. A micro-adjustable type floating presser foot is equipped as standard. This device is ideal for controlling presser foot floating in materials that stretch easily and materials with long pile. It prevents seam slippage and also prevents damage to the material. In addition, three-dimensional articles with irregular curves can also be handled with ease. You can set whether or not the tension release operates when the presser foot is raised. Uniform thread tension can be obtained even while the presser foot is raised when sewing around corners, thus maintaining attractive finishes. The presser foot adjustment screw has an adjustment scale. The presser foot pressure can be controlled numerically, so that you can reset it easily and accurately when required. This feature is ideal for use when sewing thin materials that can easily pucker when reverse stitches are sewn. Condensed stitches have a smaller sewing pitch and they help prevent fraying. A rotary-type thread trimmer is used to provide stable thread trimming regardless of the type of material being sewn. The position of the machine head hinge has been shifted 150 mm to the right, on the other side of the needle bar from the operator. The bobbin winder is located at the top of the sewing machine arm. This makes it easy to adjust the bobbin winding amount and to replace the bobbin. A variety of attachment taps are provided on the top of the bed. S-7200B with brother logo embossed into the casting.